When I lived "back home" I didn't have TV for a long time. Or, rather, I had the object TV but it wasn't plugged in to an antenna. Here it's on most of the time, and I ignore it. Nothing like noise-cancelling headphones to tune out annoying cartoons and sitcoms. Why? Well, I didn't use to believe in the old saying that average IQ sinks with every TV-set in a household, but a lot of American TV is horrible. In my opinion. I like The Big Bang Theory and Once Upon a Time, and I loved Leverage. Now I have a new favorite. One of those rare shows I actually watch and don't just use as an excuse to sit down with my laptop and tap away at a story with the imaginary people in my mind. What it is? Helix on Syfy channel. 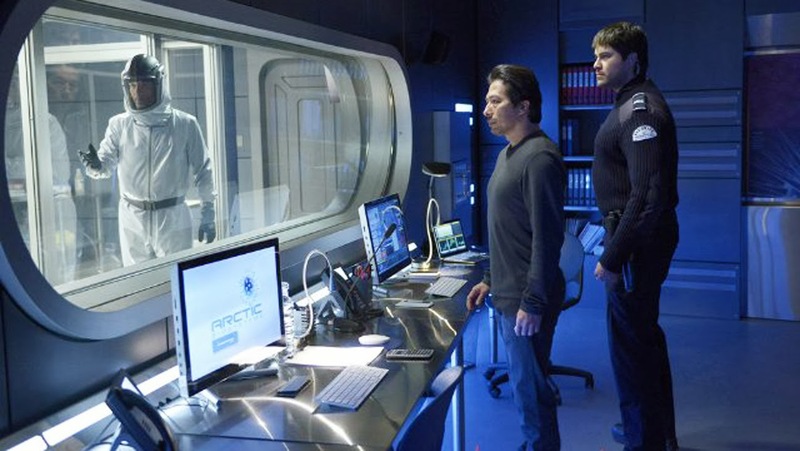 The show takes place on a remote arctic research station where a team from the CDC arrives to investigate a strange viral outbreak. Naturally nothing is what it seems and the plot keeps twisting and turning in new exciting ways I can't foresee. The characters are well rounded and full of surprises. There are too many TV shows where I know exactly what will happen, because it is what I would have done if I wrote it. In Helix, not so much. Every episode holds moments I could never anticipate. That keeps me fascinated and I count down the days between episodes. The show has secrets, danger, unexpected cruelty and goodness, great actors, and a dash of science. I like it so much that I even remember the names of several characters. Normally I can't even remember names of real life people.